St. John’s, Walsall Wood – venue for a great concert. What I didn’t realise back then was that the Brownhills Choral still exists in the form of Deryk Langford’s Brownhills Wednesday Singers ensemble, who have a concert upcoming at Walsall Wood Parish Church (St. Johns), on the 7th November 2014. Brownhills Choral Society was one of the finest Choirs way back in the 1970s and 80s. It came 3rd in the Llangollen International Festival out of 23 international choirs. We now have the Brownhills Wednesday Singers, a 40 strong mixed voice choir, who are presenting a World War 1 concert along the ever popular Staffordshire Band on 7th November at Walsall Wood Parish Church at 7.30pm. Tickets are limited and cost £5 obtainable from Deryck Langford 01543 821999. Come along and join in a singalong of old songs from the Trenches. David Evans has charted the Choral Society from its very beginning, and also through the years of George Fullelove. Along the way, railway expert and chorister Ian Pell also turned up some great material. This is all part of a complex and surprising musical culture in Brownhills, both in the classical tradition and the more modern sense – it’s very satisfying to see that tradition continue with the Wednesday Singers. 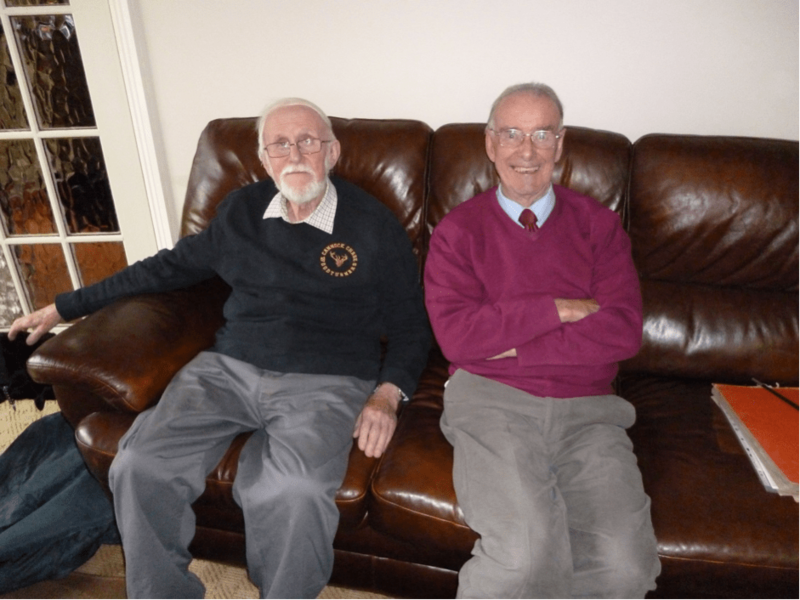 Douglas Birch MBE and Deryck Langford. Image by David Evans. This entry was posted in Brownhills stuff, Churches, Events, Followups, Fun stuff to see and do, Interesting photos, Local History, Local media, Local music, News, Reader enquiries, Shared media, Shared memories, Social Media, Spotted whilst browsing the web, Walsall community, Walsall Wood stuff and tagged 2014, 7th November, Birch, Brownhills, Brownhills Choral Society, Brownhills local history, choir, Choral, co-op, Co-operative, concert, David Evans, Deryck, dog, Douglas, Eisteddfod, George Fullelove, Langford, Llangollen, Local History, Male Voice, Marathon, MBE, New Photos, Silver Street Methodist Church, St Johns, Staffordshire, Things to do, Walsall Wood, Wednesday Singers. Bookmark the permalink.